Here at Melbourne’s Finn Design, we seem to be doing bathroom renovations and updates quite often. 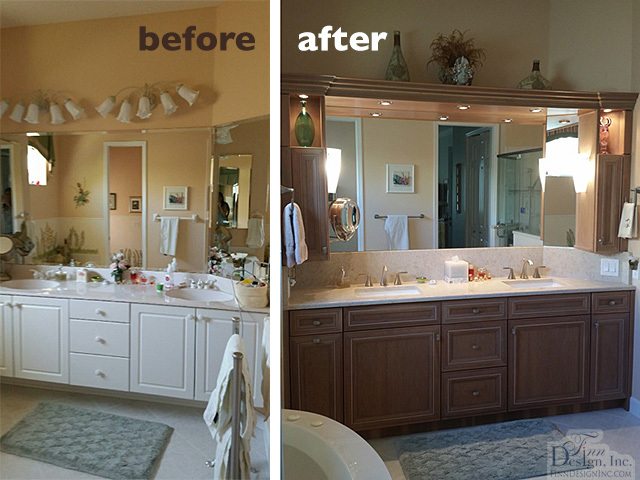 In this example, the “before” picture shows the original 16-year-old master bathroom vanity with inadequate and ineffectively located lighting, above overly sized cabinets without functionality, and with a cultured marble vanity top. Another challenge posed by the original layout was that the back mirror wall was angled on the right, and the right sink was too close to the wall. There wasn’t enough elbow room, and the person facing the mirror in that location had a distorted view, because the mirror was cut in 45 degrees to follow the back wall. Originally, our repeat client requested only an update to the cabinets, vanity top and plumbing fixtures. However, as often happens when creativity takes over, we came up with three different options, from a modest change to the most functional. Our client chose the third option, with side wall cabinets balancing the back wall angle. These cabinets – with storage, adjustable shelves and electrical outlets inside – now provide functionality for both users. For the left side, we integrated the space and power source for the attached, adjustable magnifying makeup/grooming mirror. Lighting now is provided from above and from the sides, with the option to control them separately or together. 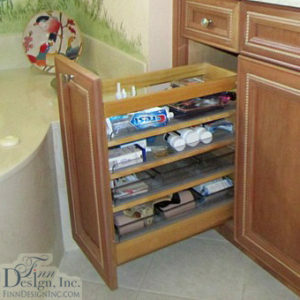 The vanity itself has a pull-out mechanism on the left, with containers for neatly organized toiletries and supplies. The rest of the cabinets have adjustable shelves and a wide bank of drawers. 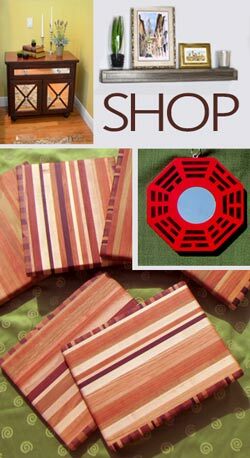 The wood is cherry with a light stain to coordinate with the existing tile and color scheme, which we didn’t want to change. The chosen zodiac quartz vanity top also complements the existing surroundings, with ease of maintenance. We also installed a towel warmer, along with designer grab bars for support and safety in the walk-in shower and water closet. This transformation shows that a practical re-design also can be beautiful.